The Astra reimagined. Meet the new Vauxhall Astra Sports Tourer – the estate version of the celebrated British city road mainstay, now available at Townparks Vauxhall in Northern Ireland. More practical and spacious, the Astra Sports Tourer is the perfect choice for those who are looking for a capable all-rounder to take them through the day in style. As confident as the hatchback version of the Astra, the Astra Sports Tourer is the embodiment of intelligent visual design. Sleek curves, confident bumpers and gently sloped lines lend the Astra Sports Tourer a distinctive allure that hints at its capability. The Vauxhall Astra Sports Tourer does not compromise on space, with up to four adults having enough space to sit comfortably on even the longest of journeys. For maximum driving pleasure, a ventilated leather Power Driver’s Seat, as well as a multi-adjustable ergonomic option are available. As with the Astra hatchback, the Astra Sports Tourer comes with the same wide range of petrol and diesel units, with power outputs oscillating between 100PS and 200PS. For the driver who prefers an economical drive, the 1.6-litre CDTi ecoFLEX diesel is a clear winner, delivering up to 83mpg and carbon emissions of only 89g/km. For those who prefer a greater balance between economy and power, the 1.0-litre 105PS and 1.4-litre 150PS petrol units are great choices which emphasize power and torque. Designed for families, the Vauxhall Astra Sports Tourer is equipped with all you need to make the most out of your driving experiences. With practicality assured by up to 1,630 litres of space, the convenient technology available includes a 7-inch infotainment system, electronic climate control and hands-free power tailgate. Awarded with a five-star safety rating from Euro NCAP, the new Vauxhall Astra Sports Tourer incorporates advanced features such as Advanced Park Assist, Lane Departure Warning and Forward Collision Alert, among others. 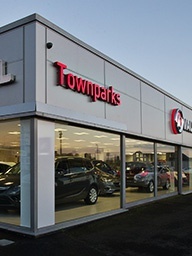 Get in touch with Townparks Vauxhall in Northern Ireland today to learn more about the practical new Vauxhall Astra Sports Tourer. Fill in the provided enquiry form or call the displayed phone number to contact us and book your next test drive.